Power Strut Square U-post base with a hole size of 9/16-Inch, comes in electro-galvanized finish and has ASTM A575, ASTM A576 steel construction for added durability. 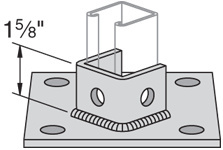 The pad of the base measures 6-Inch x 6-Inch while the post is 1-5/8-Inch high. 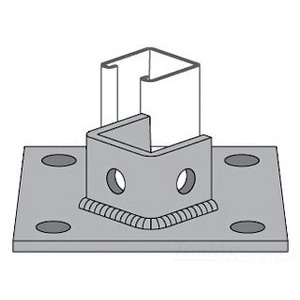 The post base has a hole spacing of 13/16-Inch from end and 1-7/8-Inch on center. It is ideal for use with PS 200 and PS 210 series channels.